Edwina S. Uehara, Ph.D. '87, was named the Edith Abbott Award recipient at a celebration held during SSA's Alumni Weekend on June 2, 2007. The Abbott Award is given to an SSA graduate who has demonstrated extraordinary career success and consistent, long-term, high level achievement. 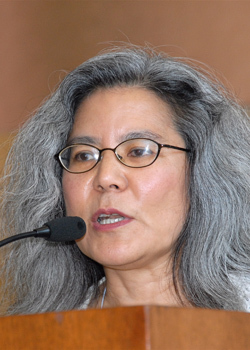 Uehara currently serves as dean of the University of Washington's School of Social Work. Prior to joining the faculty at the University of Washington, she completed a National Institute of Mental Health postdoctoral fellowship in mental health services at the University of Chicago. Her active research agenda looks at the effects of violence both in urban environments and on immigrants who experienced violence in Southeast Asia. In addition, she is interested in social networks, social support systems, and the financing and organization of health services, particularly as they affect economically disadvantaged ethnic minority populations.